The primary focus of the teams at Five Star Painting and the Dwyer Group is on helping our franchisees meet and exceed their financial, professional and personal goals. Our expertise lies in providing exactly the right tools, support and environment to turn those goals and dreams into a reality. We see it happen every day. Why shouldn’t it happen to you? People go into business by way of two paths. You can choose to go it alone, or with the support of a results-driven business model. 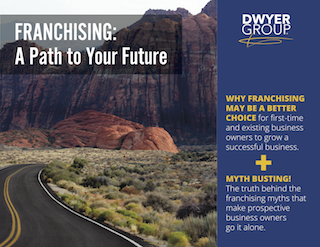 Find out why franchising may be the right path for you by accepting our FREE eBook, “Franchising: A Path to Your Future”, when you find out more about one of our brands. What are you waiting for? Learn more TODAY!